The declarations of Prague and by the European Parliament in 2008 have encouraged the disinhibition of right and far right ideologies in Europe and the decline of the thought related to the social progress. This decline has occurred even among a fragile part of the left supporters and elected representatives. This is due to the ability of the Right wing to impose its economic conception as the sole viable model despite it has generated the financial and economic crises and correlated social injustices that despair the peoples. A certain number of left wing elected representatives are even convinced that in order to achieve their ambitions they must acquire a rightist appearance allegedly "efficient and wise" as opposed to the "unwise and spendthrift" caricature of the left wing propagated by the right wing. Yet the reality is exactly the opposite, because the mismatch between models of the expenditures and revenues compounded by the right wing has led to budget deficits and increasing public debt. The preponderance of right wing thought in economics has distorted the interpretation of the economic and financial crises and of their social consequences. We propose to gradually modify in France the current economic and social pattern taking into account the European and international constraints to achieve its radical change within five years. The public debate confusion is partly due to the Medias’ oversimplification of concepts of economics, which are a major field of application of ideologies. The analysis of the relationship between public debt and public deficits deserves a new approach. These infrastructure and assets generate future incomes, expenditures reduction and employment for the nation. We prefer positive assets to productive assets since they may also induce expenditures reduction. The debt related to these deficits is an acceptable way of financing since their correlated incomes (direct and indirect) or savings will reduced the correlated indebtedness. The indirect gains may be for example those issued from employment, issued from the new activities permitted by these expenses e.g. new transport or energy systems in addition to their direct revenues or induced savings. In France, for example, the public debt cover deficits originating from the mismatch between expenditures induced by the national pattern based on solidarity and the national revenues pattern in course of distortion by a conception far from solidarity. An expenditures pattern based on solidarity should be harmonized with a similar pattern of revenues also based on solidarity. Solidarity is a typical characteristic of a left wing model, but it could also be due to National history and identity such as in Sweden or in a much lesser extent such as in Germany. France has an historical pattern of expenses based on solidarity but the Right wing governments, question constantly the legitimacy of the national identity by distorting the revenues pattern progressively adapted to Right wing ideology generating thus deficits and public debt. The right wing model reduces the collecting of direct taxes by many ways expecting that the revenues freed of taxes will be mechanically invested in positive assets for the benefit of the nation. This naïve conception is a clear support of the most privileged social class. In order to reduce the budget deficits generated by this disharmony, the right wing French governments tend to reduce expenses arising from the national pattern and progressively diminish the solidarity between the citizens. This is not the case of all countries and we may note that the various Governments of Sweden and in a lesser extent of Germany do not question their national patterns as in France for example. In France, the budget deficits and correlated public debt has more to do with ideology than with economics. Right wing French governments made a frontal attack of the country's national pattern and identity based on solidarity. In France the reduction of solidarity expenses is called “Reforms” despite “Reforms” are more often linked to progress than to regression. The usual meaning of words may be perverted in order to obfuscate the reality. The French Government found inspiration in the UK regarding unemployment policy. This led to nothing but UK is with USA, a country particularly opposed to solidarity, which is the heart of the French national identity. On the contrary UK and USA symbolized countries of wild freedom as opposed to what we will name civilized freedom. The percentage of population below poverty is 12% in the USA and 14% in the UK as compared to 6% for France and to 0% for Sweden. The national identity of France is impaired since the country suffers of a disparity in revenues distribution among citizens, which is similar to that of the UK. The lack of revenue due to right wing ideology and policy increased the budget deficits and then the public debt. The mismatch between patterns of income and expenditures by the ideological rejection of the national identity pattern based on solidarity" is the unwise and "spendthrift" long term attitude of the right wing dishonestly granted to the left wing. A simple correction of the current tax system could fill in excess the budget deficit (In France € 136.5 billion in 2010) and will then reduce the disparity of revenues distribution between citizens but will not permit to reach a satisfactory level of fair distribution without increasing the minimum salaries and other social subsidies. The reluctance of people regarding tax increase comes only from the fear that the unfair current system of taxation might be not changed. Of course the increase of Tax revenues commands a fair taxation system requesting the biggest effort from the beneficiaries of the highest revenues, which is not the current situation. A first step for France could to reach a similar level of income distribution as in Germany. The tax increase and correlated deficit reduction will be helpful but not sufficient. The increase of minimum and low wages is also necessary. This will be possible by the common effort of private and public sectors. In paragraph V the corporate mission should developed in this respect and in particular how to protect them from the speculative influences and stock yield obsession, which prevent them to fully play their part in the social frame as any other citizens. The purchasing power of the public servants might be improved through the proper correction of the taxation system. France is less egalitarian than other European countries ruled by right wing to the point that a few very wealthy French citizens asked themselves (on August 23, 2011) to be more heavily taxed. The comparison with other European countries will help the Safeguard the French pattern of solidarity and will permit other peoples of other countries to justify a greater request of welfare by reference to existing and performing systems. If the left wing has no clear convictions in this field, it will leave room to populist and far rightists’ parties at the time of the elections. This might be seen in France where Front National is forecasted to rank 3d in the next presidential elections of 2012 with a comfortable percentage of votes. We must note that the most egalitarian country of the world is SWEDEN and has negligible budget deficits and public debt. The Swedish example is more in line than Germany with the French conception of solidarity taken into account the History of the country and the past and recent social battles of the people. There are many parameters and indices to measure social injustice, but we have chosen the Gini index for its clarity is its immediate comparative interpretation due to available data throughout the world. The world's most egalitarian country of the world is thus Sweden with 0.23 / 1, and Germany , the most important member of European Union has an index of 0.27 / 1 higher but still satisfactory. The index of France of 0.327 / 1 is quite similar to that of the UK of 0.34 / 1. We do think that the main reasons for the very recent violent riots in the UK are its social disparities as shown by the index and by a too high level of poverty for a developed country i.e.14% as compared to 6% in France and approximately 0% in Sweden. On August 6 and September 3, 2011, Israel has experienced the greatest social upheaval in his history because of the social inequalities shown by a Gini index of 0392 / 1 due to the policy of his far rightist of his Government, which also slows down the peace process. The worse problem of Israel is the wide poverty. Officially 23.6% of the population lives below poverty line but this figure is substantially underestimated by a criteria close of that of emerging country. The poverty line in Israel is only 158 € per month in a country where prices are often higher than those of France. In Europe the poverty line is calculated as 60% of the median revenues, which is not the criterion of Israel. 300 000 people demonstrated on 6 August 2011 and 450,000 on 3 September 2011: A the French scale this would have represented a demonstration of 4 000 000 people. The problem of insecurity is existential for the election of the far right wing. This argument is widely utilized to divert the attention of Israeli citizens from social issues and in some way to distort the elections to the Knesset. Insecurity is also utilized in France and in the UK with probably the same purpose. Our tax figures analysis shows that our tax system is built similarly to the other aspects we have underlined in this note, on the basis of a selected ideology which privileges a restricted part of the population. We must end the myth of the spendthrift left wing and demonstrates that fair applications of funds balanced increased collected resources are legitimate in the name of our value of solidarity particularly in time of crisis. The wide income disparities are together the result of the type and volume of taxes and of the insufficiently redistribution of the income issued of work. Additional taxes are always badly considered if they are based as iti is the case today on an unfair repartition. Some publications indicate that taxes and social levies in France are among the heaviest in the OECD, but these assessments are made on the basis of non-comparable items. The purpose of these assertions is to demonstrate that taxes in France cannot be increase furthermore. The OECD countries includes in their calculation of levies and taxes relative in percentage of GDP, only the social contributions paid to government agencies while the social coverage is often provided in many of these countries by private companies and insurance on the contrary of the situation in France. In France most of social services and insurance are provided by States bodies to most of the population. Then the burden of social levies may appear heavier in France than in other countries for this sole reason. Even we include the total social levies without weighting correction to the taxes, we are under of the figure of 40% or more of GDP indicated in these publications. This could be checked in the 2010 figures for example. The “net” corporate taxes represent only 0.8% of GDP and 6% of the net budget, while the income tax accounts for only 2.8% of GDP and 20.5% of the net Budget before tax relief. Direct taxes account for only 5.4% of GDP and 39% of net budget. Net indirect taxes (mainly VAT) amount to 6.4% of GDP and represent 47% of budget income before tax relief but 64% of the net Budget "after tax relief. The fact that the French budget is for almost 2 / 3 composed of indirect taxes is a signal of high penalization for the poorest people and the middle class. This system, which increases income disparities, slows down also the economic growth. A left wing government must change in depth the tax system both unfair to most of people and detrimental to the overall economy. The proportion of indirect taxes should be reduced and the direct taxes should be increased both in proportion of the budget resources and GDP and thus in volume. 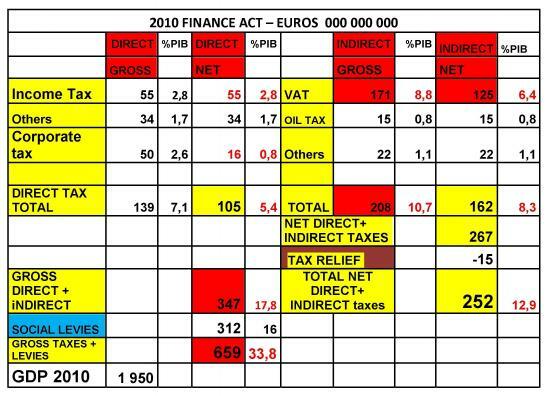 A level of levies and taxes equivalent to 40% of the GDP should request an additional collecting of Euros 117 billion on the basis of 2010 figures. The figures show therefore because the current right wing government does levy sufficient resource, it may be considered as unwise and spendthrift. Given the political and economic influence of this country in the European Union and in the world we must take into account its situation. As in the former examples, the situation of the USA is also the result of its national characteristics. Being the biggest supporter in the world of a totally free and wild Capitalism is one of its major characteristics, though this system was repeatedly threatened by its own financial system. The economic non intervention is a strict condition of the philosophy of the free Capitalism. Nevertheless and in order to safeguard the non-interventionism and free Capitalism, the government of this country widely intervenes with the resources of the citizens to prevent the collapse the financial system and more recently the bankruptcy of its essential automotive industry. The free Capitalism thus failed regarding finance, Industry but also infrastructure and energy resources renewal. The free capitalism is no more adapted to the complexity of the current world’s economy and the State intervention is a corner stone of the protection of the long term interest of the citizens by themselves. A new economic organization should be found to replace this obsolete system similarly to the former application of Communism. The US economic system might have partially motivated an unnecessary military conflict based on forged reasons. This conflict did not reduce the dependence of United States on foreign oil price variation and the fact that it imports 60% of the needs is still an aggravating parameter for its economy. The deduction of consumption in volume would have been a more adequate solution, since oil prices have regularly increased. The conflict worsened among others, the situation of the USA by the accumulation of related budget deficits and then related public debt to cover them. The public debt was about USD 6 trillion dollars before the second Iraq war and should be approximately USD 15 trillion in 2011. However the public debt inclusive of limited increase authorized recently by the Republicans should not exceed the level of the GNP. The target of the limited debt increase agreed by the Republicans is to block the Democrats’ social projects. S & P has worsened the situation in downgrading the rating of the country with a possible risk of financing cost increase, which might involve an economic slowdown in the country and then in the world trough international transactions. As a matter of fact the USA is nevertheless one of the most inegalitarian countries of the world with a Gini index of 0.45 / 1. Such figure is more usual in non-democratic emerging countries. In addition the USA has a high level of population below poverty line of 12%, which is close of that of the UK. High disparities, poverty, over armed population generate a substantial domestic insecurity. This context is darkened by the application of the death penalty symbolizing a past era of humanity. The USA has “by far” the highest population in prison in the whole world before China ranking second. 2.2 million People live in prison as compared to 1.5 million in China, which has a population 4.3 times more important than that of the USA. Many banks have suffered substantial losses from countries and corporate risks taken among others on the basis of the ratings given by these agencies; this situation combines the irresponsibility of the banks as well as the lack of reliability of these ratings agencies. These agencies may at any moment change their long term ratings when Banks are committed till maturities. The Markets often follow the Agencies, which can sometimes follow the Markets. Ratings were often changed when payment defaults or Bankruptcies were already publicly known. In this case the agencies have made forecasts of the present time and sometimes of the past. We should also note that some countries were well rated as a result of their lack of democracy assessed as a guarantee of social stability instead of the contrary. The lack of reliability of these agencies is due to their rigid, conformist and conservative assessments linked to their ideological preference. Despite these bad references, these agencies have still a spillover effects on non–immune markets. An improper rating may have material adverse effects justifying afterwards the initial wrong rating. We suggest reducing their influence power by transferring the function of referring assessment (opinions, ratings, research, mathematical modeling and choice of parameters ...) to several supranational bodies away from speculative considerations. If states and central banks indications refer often to the opinion of theses bodies, they might eventually impose their assessment to the markets. A company may finance its assets by borrowings, cash flow and equity, the latter increasing also its creditworthiness. Capital increase through the open market is a choice of the corporate based on its strategy, financial cost management or constraints such as a rigid limitation of its borrowing capacity. The primary corporate mission is not to take into account its stock market value or its short term yield but to produce, develop and improve products with the necessary assets in order to stabilize its current markets and conquer new ones. The primary corporate mission should guarantee its long term activity and its wide participation to the national social policy of the countries where the corporate has its production centers. In the frame of its primary mission, a corporate is concerned by the market value of its stock only if it intends to increase its Capital externally or if it fears a hostile takeover or aclear threat from a sufficient number of stockholders who would like to change the industrial and commercial plan of the company in favor of the sole short-term performance of their stocks. The stock market value is only a conjectural opinion often based on simplistic analysis including often forecasts based on past events and results. The market indices are featured by the Medias, which give them the value of an objective assessment of the economic situation although they are highly versatile and conjectural. Market values and indices seem to have an important place in the Medias because of their simplistic aspect, which is misleading and represents a good announcement effect favorable to the ratings despite most of the viewers are not stocks investors or speculators. This over information diverts the corporate from its primary mission and increases the shortermist influence of speculative markets at the expenses social duties. It is therefore advisable that the corporate financing does not depend on speculative markets and in order to permit it, the mission of the national Banks should be also reformed. See paragraph VI. The Trading activities of Banks for their own account introduce a double speculative risk in their structure: one inherent in the market combined with that induced by the internal traders. This speculative activity put the Banks at risk that can affect their cost of funding and then also the corporate cost of funding. Banks should halt their speculative activities and concentrate on corporate financing through a close partnership agreements under the State control. The speculative activities do not create long term real improvement for the global interest of citizens. A corporate through ad hoc partnership agreement with its Bank should fund its productive or positive assets by borrowing or capital increases in avoiding hostile actions from outside or speculative influences. The Banks trough ad hoc partnership may enable the corporate to focus on its primary mission in accordance with the social national policy and employment. In the frame of these partnership agreements, the borrowing rules might be much more flexible in order to increase the corporate financing independence from speculative markets. Productive and positive assets financing and employment increase have priority over prudential ratios, whose interest is limited to prevent bankruptcies due to fundamental commercial and industrial reality and adaptability. Heavy securities might be useless for a Bank if the financed corporate is constrained to halt its activity. On the contrary the structural constraints and guarantees may curb the economic activity. We should remind reluctant Banks that they owe their survival to the efforts of the citizens who are obliged to participate to rescue programs trough the State because of their mismanagement. Banks should serve the national production and employment. This conception of the role of Banks is not new and is understood as a result of the facts as in the very difficult post war period of reconstruction or by the ideas as in the theory of Saint Simon or in the 1980-81program of François Mitterrand achieved in 1982. We do not suggest nationalizing Banks as in France in 1982 because of the cost that this represents for the citizens and of European or international constraints. We suggest controlling directly the National Banks through laws, regulations and by the presence of state representatives to their boards of directors, as observers. These reforms could be proposed as a means of economic stabilization in the European Union. The importance of financial markets is of course not only related to the possibility of new resources through equity investments but is also linked to the influence capacity that the investors i.e. the stockholders may acquire on business management. The influence of stockholders perspective may be concentrated on immediate stocks ‘yield and impairs the business plan and sustainability of the company. Hostile action of the market is not limited to the takeover by an adverse group but also includes the pressure from existing shareholders on the company policy that would uphold their financial immediate interests against those of the company to fill its commercial, industrial and social mission. Ideal stockholders are stable and attracted by the business logic rather without changing it at their sole immediate profit. The regulation of capital increases and as a result of stockholders’ power distribution should focus on the Partner Banks of the corporate so they can block any stockholders’ action such as that of pension funds to impair for immediate yield advantages, the future of the corporate, its workers, and its national role. This suggested may only apply to large national corporate, the target being to protect the largest share of industrial and commercial sector. This policy may appear highly interventionist but it is the sole way in certain countries like France, UK and even USA to reach a better distribution of the revenue among the citizens as in other capitalist countries such as Sweden and in a lesser extent Germany. The dynamics of the economy and employment is largely dependent on innovation. Stimulating innovation ensures social welfare development. Such essential key cannot be left to the sole private initiative. The private interest can be driven by short term considerations that can stifle innovation as has been observed in the pharmaceutical, energy and automotive industries. The power of the State should permit the funding, creation and coordination of all means to be dedicated to innovation without experiencing slowing effect due to private interests that innovation may endanger. The private sector may conditionally participate to the production induced by innovations issued from the means of the State. By preventing or hampering the revenues of obsolete innovations, the State may encourage the private sector to maintain an innovation effort. Innovation does not concern only the economic sphere but all human activities including the innovation itself. The social and ethnic diversity of the citizens is a factor favorable to the spirit of innovation that can be taught and encouraged from an early age.